Abbott's i-STAT point-of-care analyzer is transforming how the Chicago Marathon keeps its race participants healthy for 26.2. On marathon day, Chicago’s streets are packed with 45,000 runners (not to mention the 1.7 million spectators cheering from the sidelines). In the span of four to seven hours, anywhere from 900 to 4,500 people can enter the race’s medical tents needing some form of medical care. Approximately 1,500 medical volunteers work together to provide course-side assistance, prepared to treat everything from blisters and dehydration to more serious conditions like heat stroke and heart attack. Amid the ice packs, monitors and I.V.s, a small, handheld diagnostic technology, Abbott's i-STAT system, is at the center of this sophisticated pop-up treatment program. The portable tool, supplied at all 20 aid stations along the course as well as at the finish line, requires just two to three drops of blood from runners who may be in medical distress. Providing results in just minutes, the i-STAT point-of-care analyzer can help medical staff quickly determine a treatment path and, if possible, ease runners back onto the course, says George Chiampas, D.O., medical director of the Bank of America Chicago Marathon and assistant professor of emergency medicine and orthopedic surgery at the Northwestern University Feinberg School of Medicine in Chicago. 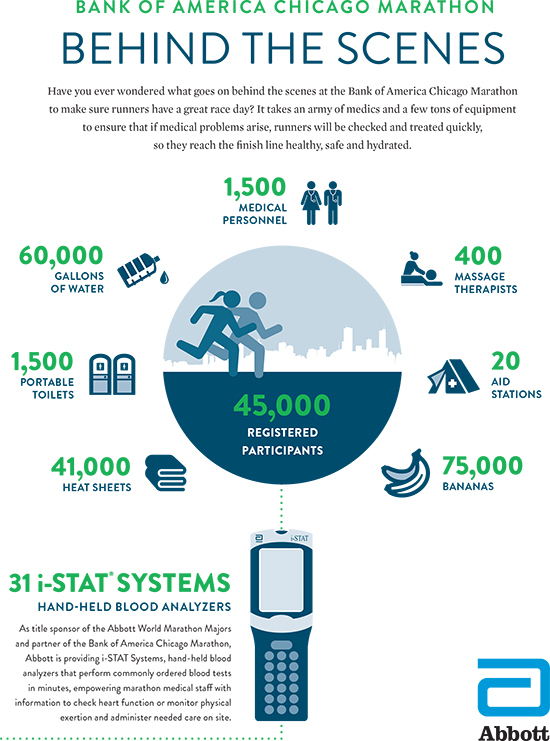 "The i-STAT technology drives every step in how we treat many runners who come into the medical tents. It allows us to monitor and treat them more effectively—and administer that treatment much more quickly than was possible before," Chiampas says. Without such testing procedures, most runners would have to just sit it out or go straight to the hospital, where lab testing could take hours, says Dr. Paul Jarvis, director of global medical affairs for Abbott’s point of care diagnostics business. In the past handful of years, the Chicago Marathon has used the i-STAT CHEM8+ testing cartridge to, in part, help determine dehydration and evaluate levels of electrolytes such as sodium and potassium. "If someone has low sodium, also known as hyponatremia, the last thing you want to do is give them I.V. fluids quickly," Jarvis explains. "It's important to administer fluids at a slow pace to prevent any complications." That's especially true because the symptoms of low sodium levels—such as fatigue, muscle weakness, nausea, cramps and potential seizure and coma—are nearly identical to those of dehydration. What’s more, by not just testing electrolyte levels but also blood urea nitrogen and creatinine levels, it can pinpoint serious conditions such as heat stroke and acute kidney damage. Once those conditions are identified, they can be properly treated. This year, Chiampas is expanding the Chicago Marathon’s use of the i-STAT device to include cardiac testing. "This is the second largest marathon in the world, and it’s unique in that we have such a demographically diverse group of runners," he says. "It's what makes it such a beautiful event. Some are seasoned runners and others may be running for a charity or after surviving a serious health condition. A person could have underlying coronary artery disease, and it’s my responsibility to provide our clinicians with the tools that will help them make critical decisions in a short amount of time." For example, a runner entering a medical tent would receive a CHEM8+ testing, which takes 2 to 3 minutes, and those with potential cardiac symptoms such as chest pain will also receive cardiac testing—checking for cardiac markers like troponin or BNP that signal a heart attack. Results of the test take only about 10 minutes, which allows medical professionals to quickly start treatment and prepare for ambulance transfer. "We can also call the hospital and relay that troponin levels are elevated, which can trigger changes in care downstream, which we wouldn't have been able to do in the past," Chiampas says. "Getting someone to the hospital and testing these markers without i-STAT can take 30, 45, 60 minutes. In that time, there could be a very serious outcome." From a public health standpoint, Chiampas is keenly aware that because all 26.2 miles of the marathon occur in Chicago proper, sending every patient to the hospital before determining if it was truly necessary, would effectively shut down the emergency medical care for the city of 2.7 million people. "The i-STAT system truly mitigates that overwhelming tax on the public health system." The Chicago Marathon is just one event where the i-STAT system influences how patients receive care. Chiampas collaborates with other marathon medical directors across the Abbott World Marathon Majors series. "We're all about sharing best practices. Our ultimate goal is to make marathon running as safe as possible," he says. Outside of marathons, one in three hospitals in the U.S. currently use i-STAT systems, and the devices are useful in nearly every corner of the hospital from radiology to the intensive care unit to the operating room. Medical professionals are also using i-STAT systems in various clinical settings, including in hospitals, emergency departments, physician offices and rural health settings, Jarvis added. Globally, the devices are invaluable in rural health settings that have limited access to diagnostics equipment. "Up to 70 percent of critical clinical decisions are influenced by diagnostic information, so it's very important to have quantitative information to help diagnose and treat patients, no matter the setting," said Jarvis. On race day, the information provided by the i-STAT system may help empower physicians to get hundreds of runners back to good health. And, under the right circumstances, many of those runners will be able to achieve their race-day goal – to safely cross the finish line.